Explore the three main national parks of the Top End; Kakadu, Litchfield and Nitmiluk. In Kakadu you will visit the beautiful Mamukala Wetlands, the galleries of ancient aboriginal rock art at Ubirr and Nourlangie Rock, Maguk (Barramundi Gorge and Falls) and take the sunset Yellow Waters wetlands cruise. At least 60 bird species are found in these wetlands, together with crocodiles in their natural habitat and buffalo on the flood plains. In Katherine enjoy a hands on cultural experience at the Katherine Art Gallery, and cruise Nitmiluk Gorge for 2 hours viewing the beautiful scenery and discovering the customs of the traditional owners, the Jawoyn people. Finally spend time exploring beautiful Litchfield National Park. View the amazing magnetic and cathedral termite mounds and can have a swim at Wangi Falls, Florence Falls and Buley Rockholes. The tour stays in Bush Bungalows, Stockman’s room at Mt Bundy Station and a permanent camp (fixed tents) in Katherine. 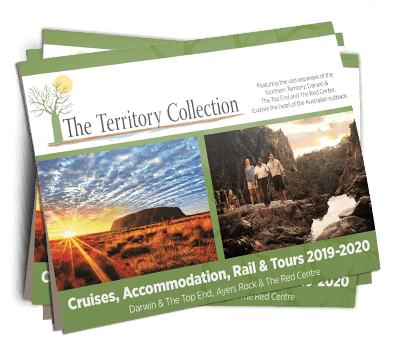 You will be collected from your Darwin accommodation at 7.30am for your 5 day 4WD Tour to Kakadu, Katherine and Litchfield. We head south along the Stuart highway and along the Arnhem highway into the wetlands region. Our destination is Fogg Dam Conservation Reserve. These wetlands have international significance because of their beauty and natural ecosystems. A great variety of fauna can be found here throughout the year as well as a large variety of birdlife. We finish the day with a look around the Bowali visitors information centre. Dinner tonight is at your own arrangement and expense and there are a couple of restaurants nearby to our accommodation. Upgrade to a hotel room with en-suite at the Mercure Crocodile Hotel for an extra $125 per person twin share and $215 single, per night. Please enquire upon booking to avoid disappointment. Buffet breakfast is included with this option. (2 night stay). Our first stop today is the Warradjan Aboriginal Cultural Centre, for an insight into the cultural heritage of the park. Then we travel to Gunlom (Waterfall Creek), in the very south of the park. After a scenic drive in, on an unsealed dirt road, we reach a large plunge pool at the base of the falls. You also have the option to take the walk to the top of the falls where pristine rockpools and a spectacular view await you. Departing Kakadu through the southern entrance, we now head south to Katherine, with a stop en-route in historic Pine Creek. Our destination this afternoon is Nitmiluk Gorge, home to 13 spectacular gorges, carved out of the rock by torrential summer rains, over millions of years. Dinner tonight will be served poolside at Nitmiluk Gorge. Upgrade to a 1 or 2 bedroom cabin with en-suite for an additional cost (varies depending which cabin you choose).Please enquire when booking, to avoid disappointment. Please note that dinner is not included with the cabins and can be purchased at the poolside bistro. We start today with a hands on cultural experience at the Katherine Art Gallery. Activities on offer include sitting down with resident artist, Manuel who will tell you tales of tribal life, language, the hunting and gathering techniques, ceremony, weapons used and aboriginal contemporary life. Experience your own Rarrk painting with Manuel and you will also have an opportunity to participate in one of the traditional hunting activities (firelighting, spear throwing etc.). After lunch you’ll cruise through Nitmiluk Gorge for 2 hours, viewing the beautiful scenery and discovering the customs of the traditional owners, the Jawoyn people. This evenings accommodation is at Mt Bundy Station. The station has an interesting history and is set in a picturesque bush setting, attracting a multitude of wildlife. There should be time this evening for a walk around the station, a swim in the pool or you can visit the station animals. Today is spent swimming and exploring beautiful Litchfield National Park. We view the amazing magnetic and cathedral termite mounds and can have a swim at Wangi Falls, Florence Falls and Buley Rockholes which are a series of small waterfalls that are a great place to simply sit and relax. There is also a lovely hike along the riverbank from Florence Falls to Buley Rockholes. Departs Darwin on Saturdays from 01 May 2019 – 31 October 2019, subject to availability.